Browsing the BBC’s Your Paintings site (every oil painting in UK public collections) is one of life’s greater pleasures. The search facility may be erratic and site navigation a tad clunky, but who cares? In among the tottering heaps of sodden landscapes, zooming Spitfires and portraits of bored vice-chancellors can be found all sorts of hidden nuggets. Here, for instance, is my selection (click to enlarge) of “lost” British surrealists from the ‘thirties to the ‘fifties – and this is only from surnames A to C. More to come in later posts, perhaps. Surprising how many of these names are Scots. Surprising too, how little ready information there is on some of them – only two Wikipedia entries here. To be fair, some of these painters were very much on the margins of British surrealism, or even on the margins of the margins. In some cases the vogue for surrealism seems to have offered itself to otherwise anti-modernist purveyors of illusionism as the only acceptable form of modernism. Which may be telling. What emerges here is mainly a style, characterised by a kind of cool Deco tonality. 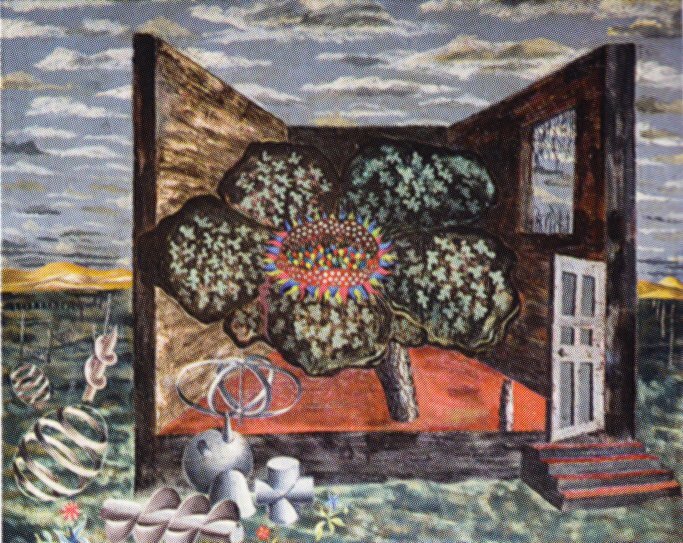 Though John Selby Bigge exhibited at the 1936 London Surrealist exhibition, he is dismissed abruptly from Michel Remy’s rather doctrinaire Surrealism in Britain on the grounds of not being surrealist enough. (Having said that, Remy similarly dismisses John Armstrong, which is absurd.) Both Edward Baird and James Cowie usually ploughed more orthodox furrows, but were clearly seduced by the still-lives-in-low-horizon-seascapes of Edward Wadsworth. Margaret Barnard seems better known for her lino cuts, having trained under Claude Flight, while of Alexander Allan, William Baillie and William Cosnahan I can say nothing except that they were born in 1914, 1905 and 1930 respectively. The painting by Angela Baynes is certainly a portrait, but for me it shares enough of a surrealist sensibility to qualify. I know nothing of her, and this seems to be the sole painting by her in public ownership. 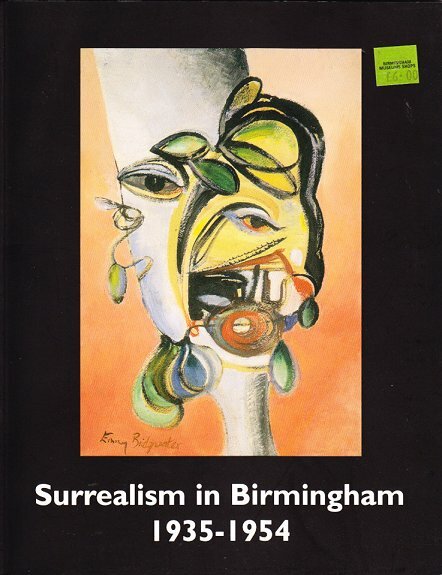 Sadly, it seems the latter can also be said of Emmy Bridgwater, who is the odd girl out here, by virtue both of her style – anything but cool Deco – and of her role in the Birmingham Surrealist group, usefully chronicled in the catalogue to the 2001 Surrealism in Birmingham show. I include her here as not so much lost as neglected. But her tense, quirky spikiness is worth a dozen of the dutiful pastiches churned out by her Birmingham collaborator, the hugely overrated Conroy Maddox. The release of the Public Catalogue Foundation’s (PCF) volumes of Oil Paintings in Public Ownership, and the development of the “Your Paintings” website, gives us all, at long last, a chance to see just what’s hidden away in the vaults of our local galleries that rarely or never comes out into the daylight. Wolverhampton Art Gallery (my local) devotes whole furlongs of wall space to its unrivalled collections of Georgian and Victorian sepia mediocrities (the Fuseli excepted), justified by a display policy focused around social and historical content, a policy which also drives their recent purchases and contemporary collection. This doesn’t allow too much of an airing for the very decent 20th century material they mostly keep under the carpet. A thumb through the PCF Staffordshire catalogue reveals quite a bunch of modernist and English surrealist items at Wolves: John Armstrong, John Banting, Wilhelmina Barns-Graham, John Selby Bigge, Duncan Grant, Tristram Hillier, Thomas Esmond Lowinsky, Augustus Lunn, John and Paul Nash, John Piper, William Roberts, Stanley Spencer, John Tunnard, Anthony Twentyman (six canvases), Edward Wadsworth, Alfred Wallis and, last but not least, Christopher Wood. Most are not often seen on the walls, and some never. They would make a good roomful, and a nice change from all those dull Georgian worthies and Victorian farm girls. And in the Wolverhampton basement there is also this: Atomic Flower by Humphrey Spender. (This small image here will have to do for the time being.) Yes, that’s Spender the photographer, Mass Observationist, textile designer and brother to poet Stephen. His paintings (a bit of a sideline) tended to follow prevailing styles, which in the late ‘thirties for him meant surrealism, though Michel Remy carefully excludes him from his 1991 study, Surrealism in Britain. This canvas is dated to 1939-40, and is not among his most technically accomplished, even for that relatively early date. But to me it seems of unusual interest. The collection catalogue describes it as an “open interior of a room in a landscape. Inside the room is a giant flower with a colourful fiery centre. There are scientific/mechanical objects placed in the landscape.” The “room” is perhaps better described as a box-like building with the near wall and roof missing. A front door is left hanging in space above the steps, and a window has clearly been blown out. The walls appear black and charred. Distant mountains are fronted by a flat plain punctuated by receding poles or fence posts in the manner of Paul Nash etc. The foreground objects clearly owe a great deal to Edward Wadsworth’s semi-surreal marine still lives, a couple resembling ship’s screw propellers in a non-specific way. In the corner of the room sits a metal object composed of three elliptical loops around a central axis. At the heart of the building, and of the composition, a huge dark textured flower unfolds, its five molten petals surrounding a centre of orange and blue flames – the atomic flower of the title. Despite the naivety of its execution, the image achieves a disquieting and threatening quality. Given the dating, we are likely to take this for a Blitz image, a surrealist variant of the bombed street ruins made iconic, in a neo-romantic way, by John Piper, John Minton et al. On the other hand, given the title, this does look uncannily like a premonition of nuclear warfare – gleaming scientific instruments creating a mushroom-like exploding fiery form that devastates the landscape. And where is this landscape? (New Mexico? Los Alamos?) How likely is any of this for 1940? Nuclear fission was discovered on the eve of World War two, and a practicable atomic bomb was still widely considered impossible in 1940, the Manhattan Project not getting under way until 1942. Could the dating of the painting be wrong? Or the title have been adopted at a later date? The term “atomic flower” is now sometimes colloquially applied to the familiar stylised “atom symbol” representing electrons circling the nucleus. Variants show either three or four ellipses, making six or eight “petals”. Remarkably, a three dimensional version of this symbol is present in the painting, in the shape of the scientific object on the corner of the floor. The symbol may have been known to Spender at this time in some diagram form, but the term “atomic flower” is a recent coinage, making his prescience even more striking. The term has lately acquired a different connotation. As a contribution to the work of the US Human Interference Task Force, charged with devising “nuclear semiotic” warnings against contact with stored radioactive waste that will remain intelligible for the next 10,000 years, the SF writer Stanislaw Lem has proposed the development of “information plants” or “atomic flowers” that would grow only in the vicinity of terminal storage sites. Spender’s monstrous flower lends itself well to this scenario. Though the fear of “nuclear apocalypse” was not born until 1945, the catchphrase “Apocalypse” or “New Apocalypse” was coined in 1940 as an umbrella for the vague coalition of philosophical anarchism, “personalism” and neo-romantic tendencies in the arts, loosely related to surrealism, promoted during the war years by Henry Treece, J F Hendry, Stefan Schimanski, Robert Herring and others in reviews such as Transformation and Kingdom Come. It seems ironic that at the end of the war, just as the coherence, such as it was, of the New Apocalypse movement was unravelling, the prospects for nuclear apocalypse suddenly drew terrifyingly close. A real New Apocalypse! The poetry of the Apocalypse movement has since been largely discredited in critical terms, though British neo-romantic painting has enjoyed a re-evaluation over recent years. The quality of the Apocalypse poets and writers was variable, to say the least. But the movement is not without interest, and I aim to consider some aspects in the future on this site. Spender’s Atomic Flower would have made a fine poster image for the New Apocalypse.